Download the Crazy Eights card game by LITE Games now for free in English. Crazy Eights is the popular card game that practically everyone has played in some form. The original – a real classic! Play it for free on your smartphone or tablet now, no registration necessary – you can even play offline! With its numerous incarnations such as Switch and Mau Mau, Crazy Eights is without question the most successful card game in the world. In order to win, you need the right strategy and a good hand – every round is different, so Crazy Eights delivers unlimited gaming fun! The game Crazy Eights is also known by other names, such as Switch, Last One, and Rockaway. The basic rules of Crazy Eights are simple and quick to learn. You’ll find instructions and explanations in the app! As there are so many variations on Crazy Eights, our LITE Games version allows for all kinds of rules and settings to be adjusted: number of cards, direction changes, jokers, extra draws, and much more! • Crazy Eights for iPhone + iPad is completely free to play! • Optimized for smartphones and tablets! • Easy to understand and individually adjustable rules! • Play against up to 4 opponents! With high-quality localization, Crazy Eights for iPhone + iPad is available in the following languages: English, German, French, Italian, Japanese, Korean, Dutch, Polish, Spanish, Portuguese, Turkish, and Russian. 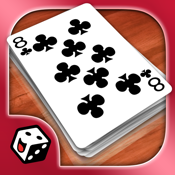 The Crazy Eights app is perfect for lovers of card games like Skat, Rummy, Hearts, or Canasta. It's simply a MUST for all card players! Download the free card game app Crazy Eights for iPhone + iPad now, and then play right away on your smartphone or tablet without registration! If you’re up for some cutting-edge tech to play some current and classic games, check out our list of the best card games for iPhone. Card games are great for when you want to keep busy, when you’re on the road and don’t have a lot of space for other games, or just on a day-to-day basis.